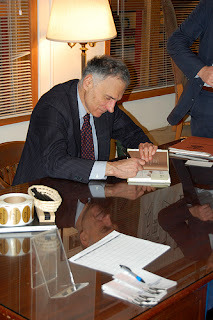 On Friday, I went a book signing by Ralph Nader who was there promoting his new book, The Seventeen Traditions. Nader is an American attorney and political activist. Issues he has promoted include consumer rights, feminism, humanitarianism, environmentalism, and democratic government. His activism has played a large part in the creation of many governmental and non-governmental organizations, such as the Environmental Protection Agency (EPA), Occupational Safety and Health Administration (OSHA), Public Citizen, Public Interest Resource Groups (PIRGs). In the Atlantic Monthly’s list of the 100 most influential Americans, published in its December 2006 issue, the magazine ranked Ralph Nader as the 96th most influential American. Mr. Nader is a very eloquent speaker, and although I may not agree with most of his views on Industry and Capitalism, I can see how passionate he is about his point of view — and this gives me great hope for the future of political and civic debate in America.